will take place on the opening weekend of WA Good Beer Week in the Perth Urban Orchard and will see over 5,000 beer, cider and slider lovers enjoy some of the best WA, Interstate + Overseas beers and ciders along with mouth watering sliders prepared by some of Perth’s best restaurateurs and food trucks. 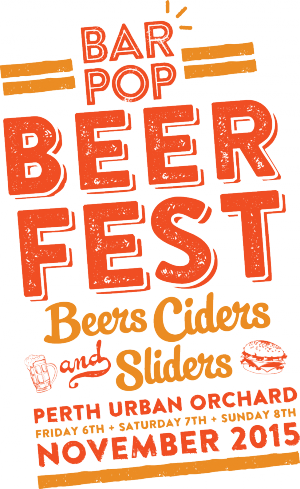 Three days of award winning local, interstate and international beers and ciders, along with tasty sliders from Old Faithful Bar & BBQ, Lot Twenty and more along with live entertainment through out the sessions. Check out www.barpop.com.au/beer-fest/ for more info! © 2019 Ticketbooth on behalf of Bar Pop. All sales are final. Tickets are non-refundable.